Peterborough Phantoms have been warned to beware a ‘very dangerous team’ tonight (February 17). The city team take on Manchester Phoenix in a midweek English Premier League clash at Planet Ice (7.45pm). And they could close to within two points of table-toppers Basingstoke with victory tonight although the Bison are in action themselves in a first-versus-third clash at Milton Keynes. 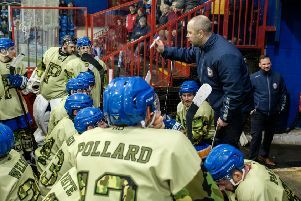 But coach Slava Koulikov insists crisis club Manchester must not be taken lightly under any circumstances after giving Phantoms a stack of tough games already this season. The latest of those was a 13-goal thriller that Phantoms edged 7-6 to kickstart their fine current form which has seen them win eight of their last nine league games, pocketing 17 points in the process to roar back into the title race. Koulikov said: “Manchester are a very dangerous team and every game against them has been close. Even the night we beat them 8-3, it was tight for two periods. “Other games have gone to overtime and penalties, and they pushed us really hard when they were last here when we found a way to come through 7-6. “We need to win every game and the way we will try to do that is by focusing on them one at a time. Phantoms and Manchester have experienced vastly different fortunes since meeting on Easter Sunday in last season’s play-off final. Phantoms have followed up their success in Coventry by mounting another sustained challenge for honours this season while Phoenix have been hit by a financial crisis and find themselves playing out of a temporary rink. Those problems are reflected in a lowly eighth place in the standings, but they still boast an impressive set of import forwards with Robin Kovar and Michal Satek among the star overseas players operating at EPL level.